So today is the day I get my first Stitch Fix. I am seriously excited. Srsly. Let me count the ways. 1) I don’t have to do anything. – After signing up for a Fix, I filled out my Style Profile. That took approximately ten minutes and was set up like a fun questionnaire. I could mark things I liked (yay polka dots! boo animal prints! ), list aversions (for all that is holy, no champagne or blush colors or cap sleeves), and indicate whether I was looking for casual clothes (yes, please) or something more work-appropriate or formal. Then I scheduled my fix and put in my card information for the $20 fee. Then you wait for your 5-piece fix to arrive. This is where this service is brilliant. If you hate everything, you are just out the $20 fee for someone to have taken the time to custom-select clothes for you. If you buy anything from your box, they apply the $20 to that purchase. If you buy everything in your box, you get 25% off the entire box. You get three days to decide and shipping is free. 2) It is not a subscription. – You can get one fix. You can sign up to get monthly fixes. There are no hidden fees. They only ever charge the $20 to send you the box. It is designed to be an ongoing thing where you develop a relationship with your SF stylist and she learns enough about your tastes to improve your selections as you go. 3) It is designed for people who are too busy. – If I have a free hour, I would rather spend time with my husband, write, read or pretty much do anything other than hang out in a mall. I worked in retail management twice and that killed off any lingering desire to spend time shopping. 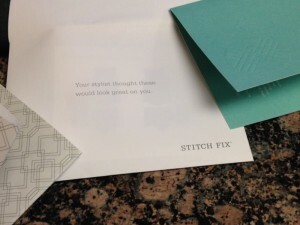 I’d imagine Stitch Fix is even better for people who have kids, because maneuvering through a store with them has got to be an exercise in eternal patience. 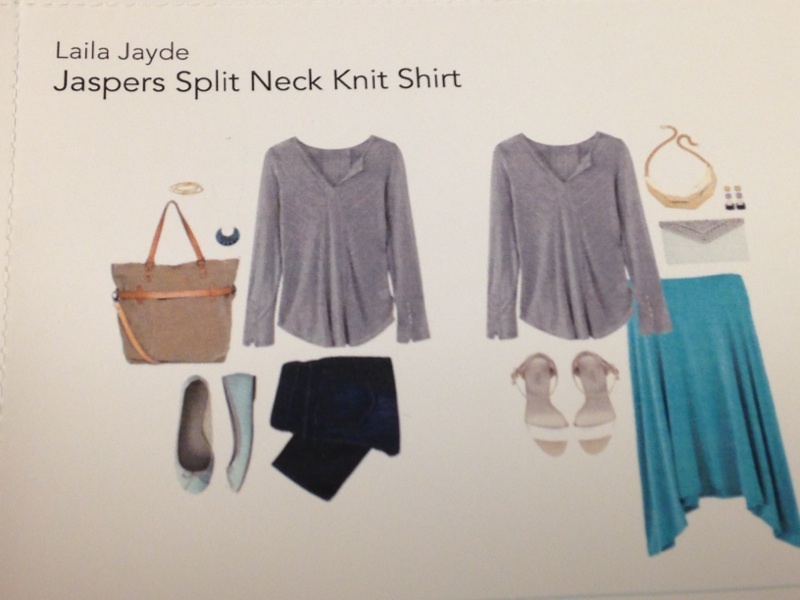 This way, the clothes arrive at your house and you can try them on with all your existing clothing, your mirror. Wondering if your new top will match the bottoms in your closet? No longer a problem! Also, who designed those stupid dressing rooms with the up-lighting and the Mirrors of the Damned? 4) It surprises you. – I can tell this, without even having checked out my own Fix yet. 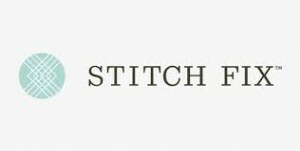 I’ve been stalking the Stitch Fox blog where they re-blog reviews from women who have tried it. Without fail, the chorus is “I thought I’d hate this, but it’s so cute!”. Sometimes we get in a bit of a style rut (alert: understatement). When I look at my closet I see black, navy, black, white, black and black. I could outfit an undertakers’ convention. 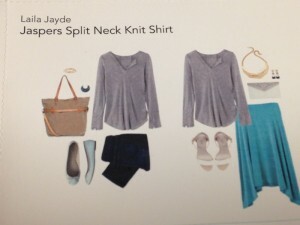 This makes dressing for work simple, but looks awfully dreary on a dinner date with my husband. I begged them to send me some color. Let’s see what they found. Other questions? Here is the link to their FAQ. Okay, just opened my first Fix and here’s my thoughts. 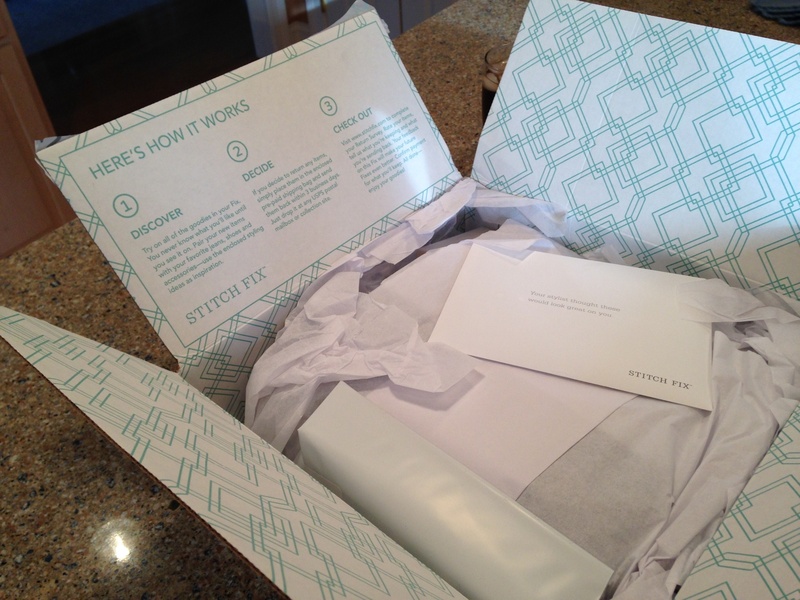 1) The packaging is stellar – Stitch Fix has a top-notch graphics/packaging person(s) working for them. The box is pretty, the clothes are all wrapped in tissue paper, there’s an embossed card enclosing your receipt and a personal note from your stylist. Everything is chosen to work together, from the font to the sticker on the wrapping. It’s all very luxe and makes you feel special before you even get to the clothes. 2) The guesses are surprisingly good – For someone who has never seen me, Marly (my stylist) did quite well. I sent her my Pinterest board for inspiration and some details about things that I know don’t work and things that I know do. The fabrics on the clothing were beautiful (and like an idiot I took no photographs before I sealed up the return package). 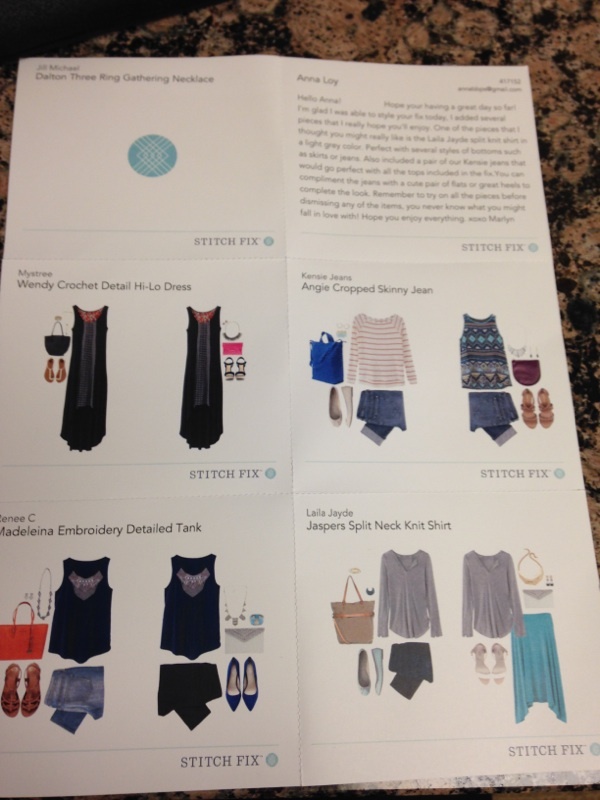 They send you a Polyvore-style picture card that offers suggestions on ways to wear your new pieces with your existing pieces, which is a great touch. 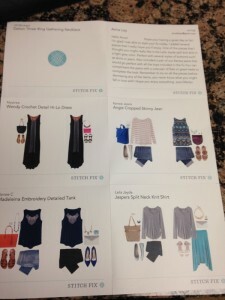 Marly sent me the following 5 pieces: one dress, one tank, one shirt, one pair cropped jeans, one necklace. 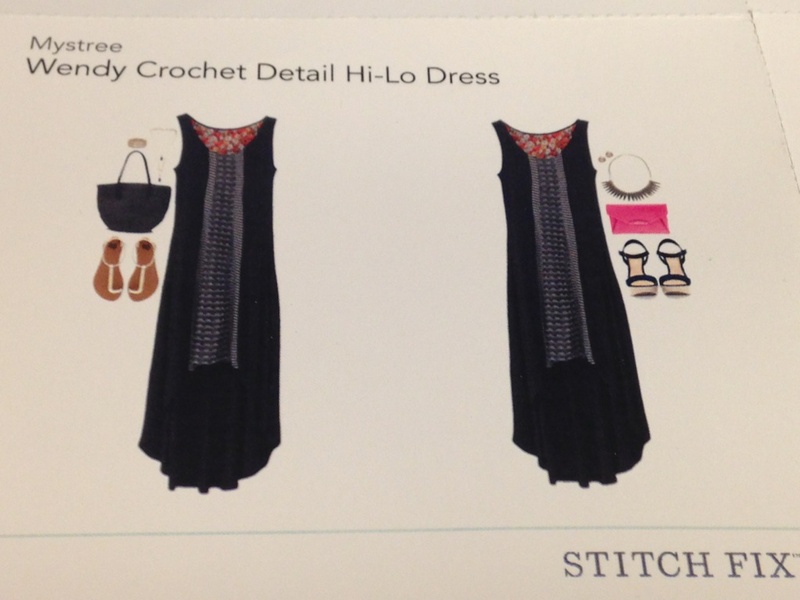 The dress was quite pretty and fit nicely, a soft navy fluid jersey with crochet detailing. I probably would have kept it if it’d been one length, but the hem is short in the front and long in the back (that’s the Hi-Lo part). It made me feel like I was wearing tails. I love, love, loved the fabric of this shirt. It was sheer and lacy and lightweight, perfect for summer evenings. The best part was the sleeves that had a cute covered-button detail and were extra long. Unfortunately, it was a little boxy on me and I don’t usually wear sheer over tank tops because it’s not flattering. This one is probably my fault, as I’d marked that I like my tops to be looser than my bottoms – but that really is just because they have to accommodate my bust dimensions. Loose all over usually means tent for me. 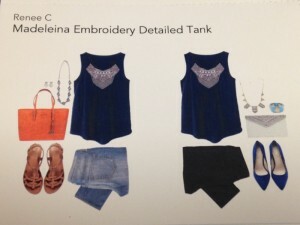 This is such a sweet tank and I definitely wanted it to work. It was a brighter navy and the embroidery detail was eye-catching. Sadly, it was too tight on the bust, but fit perfectly everywhere else. I was nervous when I saw there was a cropped, skinny jean in the package. Historically, those two words have not been my friend. Cropped usually makes me look like my pants have shrunk and skinny just means that I cry as I ratchet myself into them. But they fit super! They’re cuffed and mid-calf, so they aren’t ankle-length (which never works). Slightly distressed, with a wash that’s not too light or too dark. 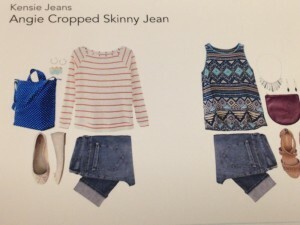 I could definitely see them being my go-to jeans for spring and summer. They look like the kind of jeans you’d wear to walk barefoot across a log bridge over a stream…wait, that was Dirty Dancing. But still! Adorable. At $88, they were more than I’d normally spend on jeans, but remember I get the $20 for the Fix fee returned on any purchase I make. And they fit perfect! And are a great, versatile piece. And I didn’t have to go to a mall and spend hours trying on a thousand pairs – win! There was also a really pretty silver necklace included, a double chain with three linked rings, very delicate. I was on the fence with this one. If I hadn’t found the jeans, I likely would have got it, but it didn’t have quite the visual oomph I hoped for the price point ($52). 3. The experience didn’t wreck my bank account. – A note on pricing: my pieces ranged from $48-88 dollars. Had I bought all five, I would’ve gotten my $20 credit and an additional 25% off (-$76). I could’ve had the whole box for $228. There is no sales tax, unless you’re in California. You can set the price ranges for your fix in advance. I set the majority of my categories from $50-100 because I figured that’d give me a good range of choices, but you can set them all ‘the cheaper, the better’, which many people do and I’ve seen some beautiful options for it. And it truly is a no-obligation service. I don’t pay shipping to or from me and my styling fee was applied to my jeans. 4. I think I’m in love! – I had so much fun opening the box with my mom. I sealed up the four pieces I was returning in the included postage-paid envelope. I can drop it in any USPS box (including those that say they won’t accept packages over a certain weight). Then I go online and give feedback to Marly on her choices. Overall, I was very pleased. I will be signing up for another Fix (seems an appropriate term, as I could see how this could be addicting) right away. Judging from other bloggers’ posts, the Fixes just keep getting better and better the longer you go. I love comments, so please leave one below. Also, I know I’m not a fashion blogger, but did you enjoy this? Lastly, if you are in the U.S. and you’re intrigued by this enough to check it out, please use my referral link here or elsewhere on the page – I get credit and I’d be ever so grateful! If you blog about your own Fix, please leave a link in the comments.